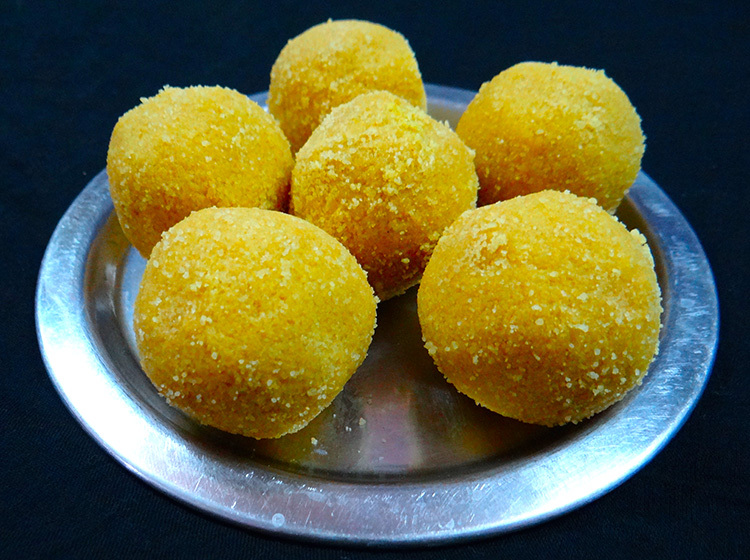 One of Lord Ganesha’s favourite sweets which is prepared especially for festivals. In a big, heavy bottom vessel or pan, heat half a kilo of ghee. Add the wheat flour slowly and start roasting it. Keep the gas on medium flame and keep adding the ghee little by little while roasting the flour. Roast the flour till the colour changes to a light brown colour and it gives off a good aroma. The 2 kg ghee should be used slowly to roast the entire 4 kg of wheat flour. Once mixed together, add the chopped cashew nuts, almonds and peanuts. Then add the cardamom powder and stir in well. Then add the powdered sugar and mix everything nicely. Heat the rest of the ghee (it should be hot) and slowly add to the wheat flour mixture, till the wheat flour consistency comes to that level that it can be made into medium sized balls. Take a handful of this wheat flour mixture and make the laddu by pressing them hard with your hands to make round balls.